The Boston Vegetarian Society is presenting the 16th Annual Boston Vegetarian Food Festival Saturday, October 29, and Sunday, October 30, at the Reggie Lewis Athletic Center in Boston. This celebration of vegetarian food brings together natural food providers, speakers, and chefs in an effort to educate people about vegetarian living. Exhibits at the festival will give visitors a chance to learn about new vegetarian and vegan items, try food samples, and shop at special discounted prices for the festival. The festival has free admission and free parking. Doors will open at 11am on Saturday, with the festival lasting until 6pm, with a special limited admission preview starting at 10am. The limited admission preview is $5. Sunday, the festival will be open 10am-4pm. 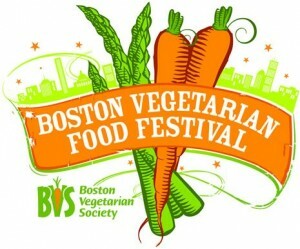 The Boston Vegetarian Society is encouraging everyone to come and learn about plant-based diets. They state on their website the festival is for everyone from longtime vegetarians and vegans to people simply wanting to add more healthy and delicious foods to their cooking ability. For more information on volunteering, sponsoring, or hosting an exhibit, visit the Boston Vegetarian Food Festival’s website. You’re very welcome! It looks like an amazing event and we’re glad to share the event with our community. Please let us know if there is anything else we can do. You can contact us with any suggestions/ ideas through the menu bar link. Thank you for including our Festival, Keith! We are planning an exciting event with great speakers and chefs and lots of foods to sample and buy. It should be a fun weekend with lots to learn and try. Thanks again.